When I was 15, my dad finished his 1959 Willies Jeep. It was/is pretty rad and got my family into off-roading. It's lifted on 37's with a Chevy 350, dana 44's, etc. We soon realized that his Jeep, although awesome, barely had room for 4 people, and had zero room for coolers, fluids, tools, etc. So I started looking for a dual purpose car when I was 16 to carry all of the things that his couldn't. I wanted one that was passenger friendly, was very capable off-road, was dependable enough to be a daily driver and get reasonably good gas mileage. And most importantly it needed to be CHEAP. My only exposure to 4x4's was pretty much all jeeps. However, I did a lot of research and finally settled on a 1985 4runner. 22re, lifted on 35's, locked f/r and 5.71 gears. It filled all of our wheeling needs and all of my daily driver needs. It was awesome. I never planned on selling it. I fell in love with old Toyotas and had many adventures in it. I spent many days rebuilding, fixing, or maintaining it, and many many days exploring in it. Eventually, my family started converting over to Toyotas as well and we have put together a nice fleet. Fast forward a decade or so and I am now married and live in American Fork in an old house. My honey-do list is ever-increasing and my poor 4runner (still a daily driver) is getting less and less attention. I had accumulated some parts and planned on dropping in a 3.4L and adding e-lockers to improve its on-road performance. That's when I found a guy named Josh (a.k.a. TRD270) selling a 1989 1st Gen SAS on 35's with a 3.4 already installed. I'm willing to admit that I pretended to be interested in it mostly to test drive it and see what mine would be like. Hopefully, use it as motivation to work on my rig. What I didn't except is how much I was going to like it. As previously mentioned, I never planned on selling mine. (Have any of you seen the movie Love the Beast with Eric Bana? You should look it up.) I was quite attached to my rig, but I test drove this new one 3 times and each time I was more and more interested. So ultimately I found a compromise that would work. I decided to buy Josh's rig, with the understanding my little brother would buy mine. I still got visitation rights to my old car and would see her frequently (our last wheeling trip I hopped in it accidentally out of habit) and I got this sweet new rig that I'm getting to know. 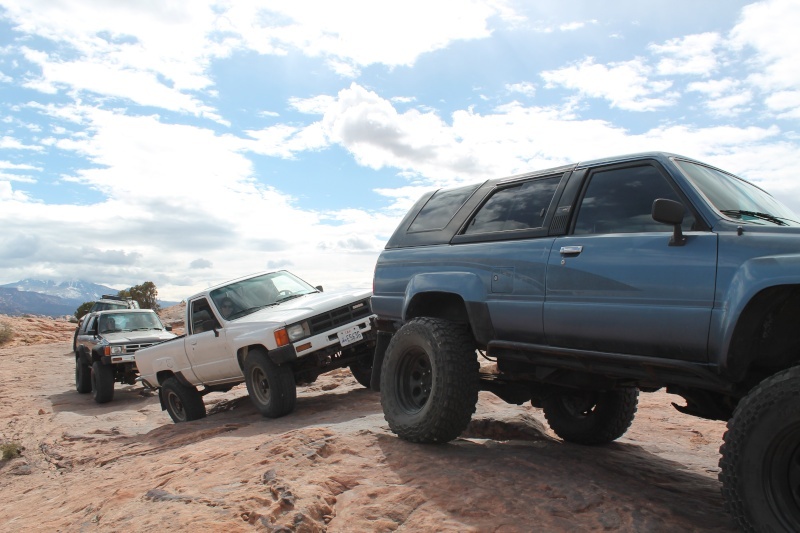 The previous owner(s) have built a pretty great rig that is awesome on and off the road. Some of you have probably ridden in it or even driven it. It is an 89 with a SAS, Chevy 63's and TG springs up front. Toyota e-lockers front and rear and a 3.4L swap. I've ran a lot of trails down in Moab, but am pretty new to wheeling up here in northern Utah, or other parts of central of southern Utah. I enjoy wheeling, but also love finding new places to camp, hike, and explore. Here are some recent pics for your enjoyment. I'm excited to make some new friends and find some new places to explore with some Toyota enthusiasts. Welcome! Those are a couple nice looking first gens there that will fit in nicely with the other couple we have. 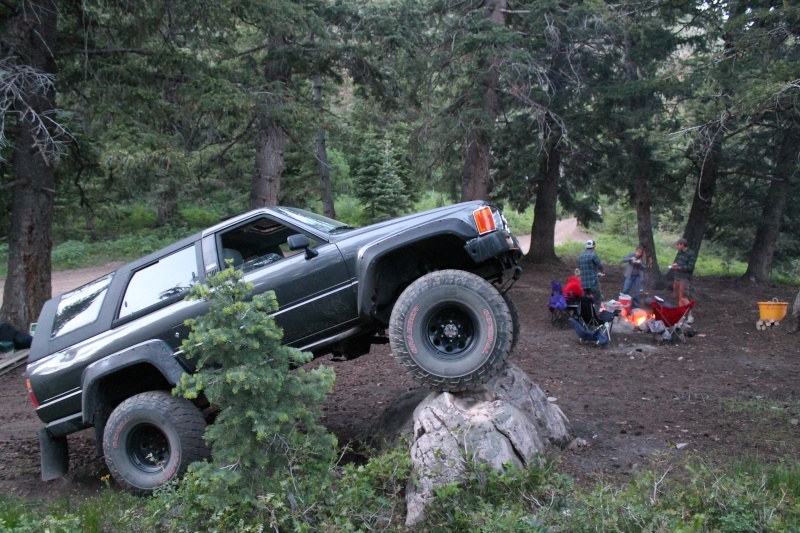 We'll have to get you guys out on some local wheeling trips soon. Check the upcoming trips and club calendar sections for some details on our weekend camping exploring trip down in the Swell. We would love to have you! 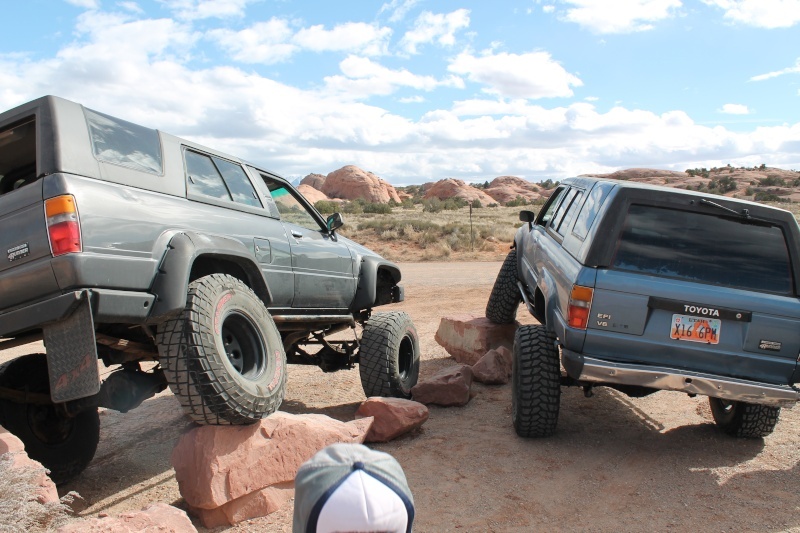 More 1st gens! Whoo! Welcome. dutchman wrote: More 1st gens! Whoo! Welcome. Don't be one of those people now Brady. That's how you used to look at 3rd gens you cheater! Sweet ride Glad someone is using it like Kevin wanted me to. Our close family friend Chuck used to own a really clean 2nd gen Toyota pickup from the mid 80's. He loved that truck. Sadly, it was stolen once when he parked it at a train station in Montana for the weekend. He was heart broken and never got it back. I hate seeing posts on Facebook of stolen rigs and would be heartbroken if mine were stolen. 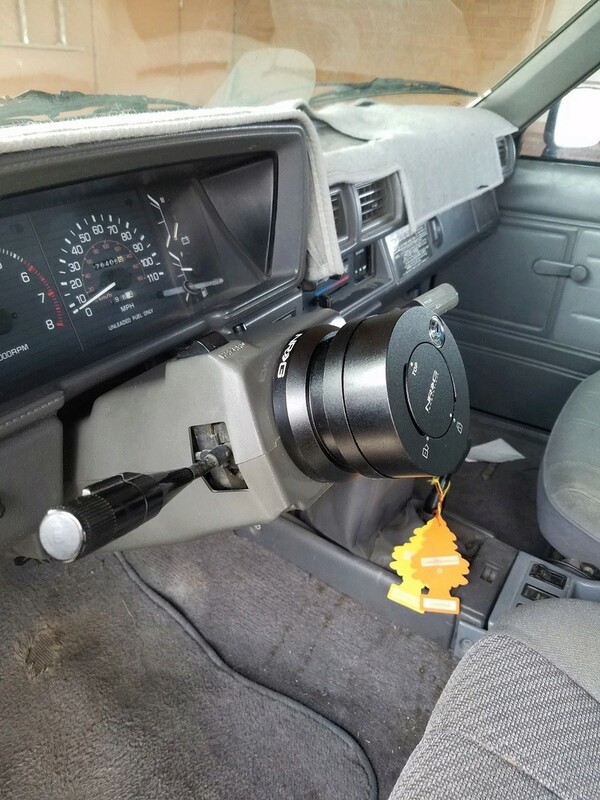 So I decided the next upgrade I made would be to upgrade my anti-theft (who needs light bars if your truck is stolen right?). 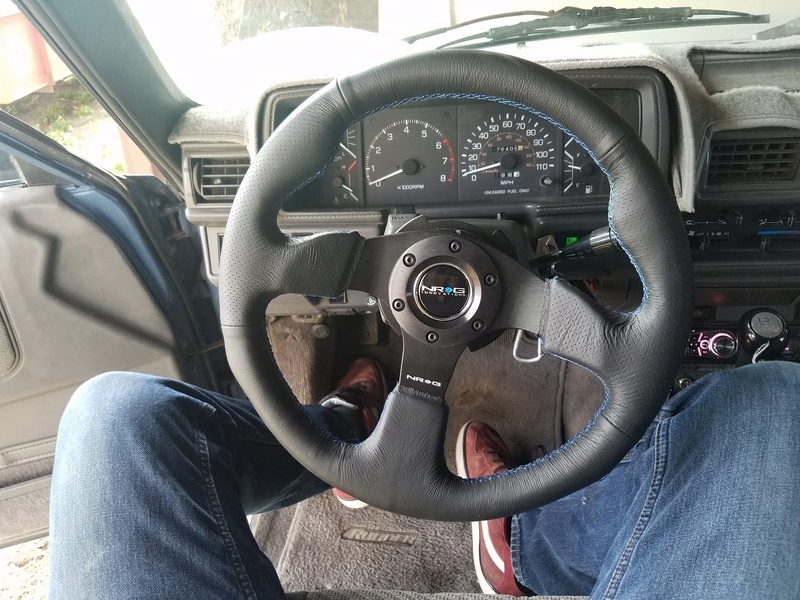 Following my brother's example, I decided to get a detachable steering wheel setup and lock from NRG. I shopped around different places online and found misc. sellers on eBay to be the most cost effective. The install was quick and easy. 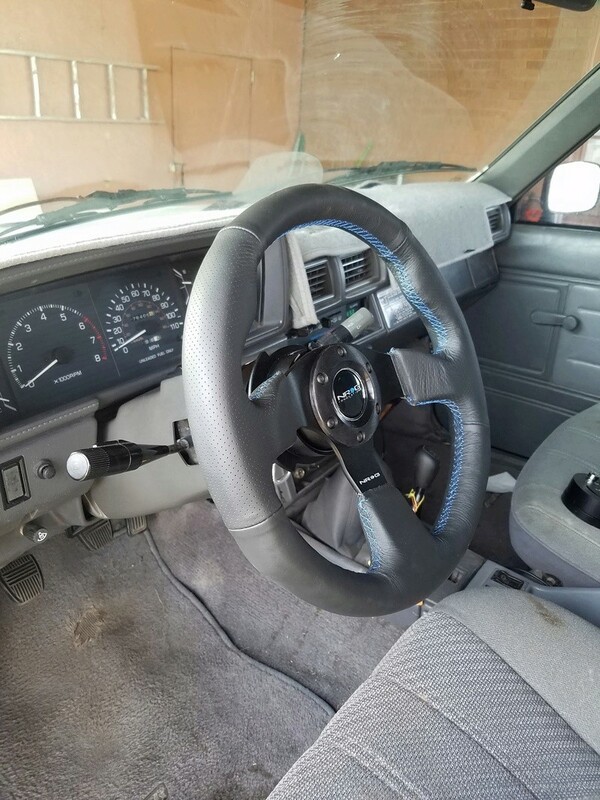 The wheel itself feels nice. It is a little smaller in diameter, and sticks just a little closer to me. 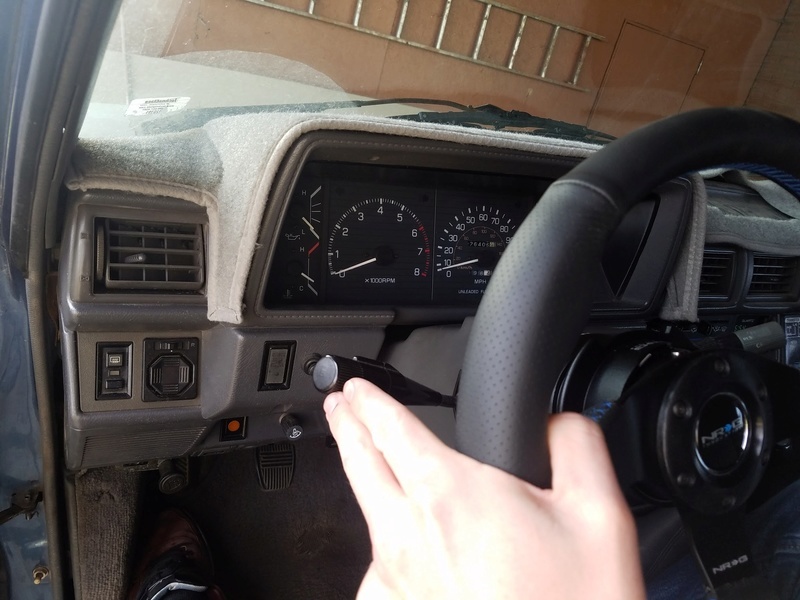 This is mostly noticed since I am very accustomed to having the blinker a certain distance and need to stretch my fingers just a little further to reach it. Good call. A detachable wheel was on my list too.